Arthur Herbert Remington initially trained as an engineer but after WWI he took up photography, using heavy glass plate cameras. His first business was thought to have been in the Greenwich area and he worked as a photographer at the Royal Naval College at Greenwich. The National Maritime Museum also hold some of his photographs in their collection. After this he moved his studio to the south coast working around the areas of Margate, Broadstairs and Brighton where this photograph, part of a series, is thought to have been taken. Later in his career he moved to South Devon and continued his business, Remington's Photo Service (later a limited company) in Torquay and Paignton until the late 1950s. This tinted photograph one of a series donated to the museum, is a posed shot taken of a child playing on the beach. Most of Remington's beach photographs use props, often the same a bucket and spade. Photographs and postcards taken by studios such as Remington's were a popular souvenir of a family trip to the seaside. This image also captures the type of garments that would have been worn by children on the beach during the 1920s and 1930s. 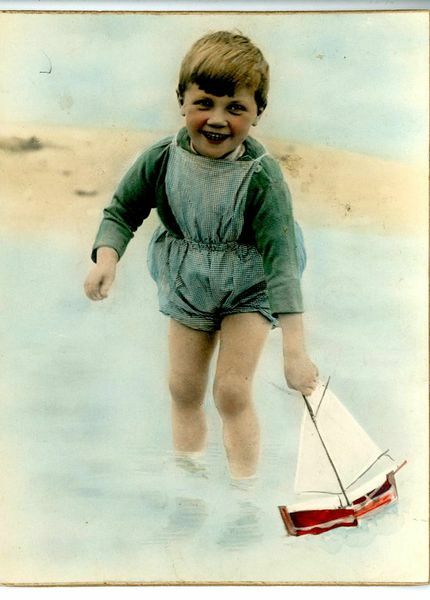 Card mounted tinted photograph of boy wearing blue gingham waders, paddling in the sea holding a sailing boat taken on the south coast of England, by Remington's Photo Service (A.H. Remington), 1920-39. A.H. Remington, father of the donor, was a studio / portrait photographer initially based on the South East coast of England. He set up a photographic business, Remington's photo service, around the 1920s. He trained as a mechanical engineer. After WWI he took up photography, initially working with glass plate cameras. Later he moved on to use a Leica 'reporter' 35mm. His first business was thought to have been in Greenwich area and he worked as a photographer at the Royal Naval college at Greenwich. The National Maritime museum also hold some of his photographs in their collection. After this he began to take seaside photographs in Margate, Broadstairs and Brighton areas where these photographs are all thought to have been taken. Later in his career he moved to South Devon and continued his business, Remington's photo service (later a limited company) in Torquay and Paignton until the late 1950s. 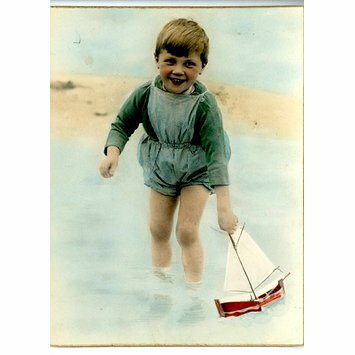 Photograph, tinted and mounted on card, of boy wearing blue gingham waders, paddling in the sea holding a sailing boat taken on the south coast of England, by Remington's Photo Service (A.H. Remington), England, 1920s. Thought to have been taken when the studio was concentrating on Brighton, Broadstairs and Margate areas of the SE coast of England.